Best Dog Training in Eastside King County, WA - including greater Bellevue and Redmond! 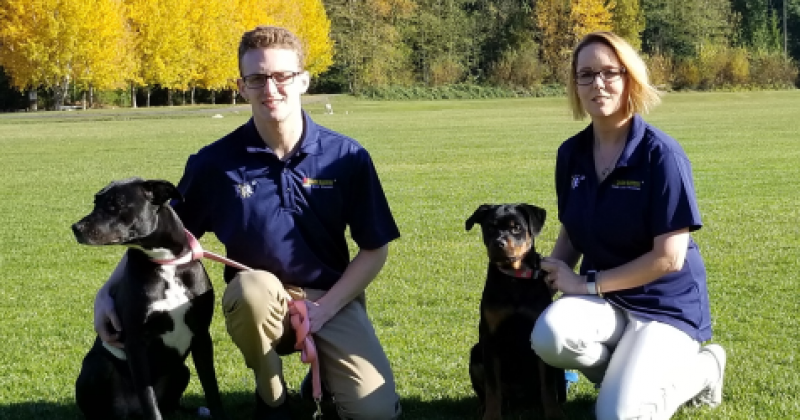 Welcome to Bark Busters Home Dog Training in Eastside King County, including greater Redmond, Bellevue, Issaquah, Kirkland, Sammamish, North Bend, Carnation, Duvall, Maple Valley and Covington! You are likely here because you're either a new puppy owner or experiencing some stress with an older dog. No worries, help is on the way! Bark Busters dog-friendly and kind training methods produce quick results. In fact, it's not unusual to have what were once "out of control dogs" behaving nicely -- sitting and waiting calmly, not jumping up and not charging the front door -- by the end of the first training session! Puppies can be challenge for new first-time dog owners (and even experienced dog owners!). We’ll partner with you to quickly sort out toilet training, nipping, and all the other frustrations that are part of puppyhood. Bark Busters does not use physically or mentally abusive training methods. We also don't use treats as the primary motivator. Instead, we show you how to apply the natural and quick strategies that dogs use themselves to influence each other. These strategies are easy to learn and you'll quickly establish yourself as the leader and the object of your dog's love, respect, and obedience. I've trained dogs for more than 15 years. My first job at age 15 was in a vet clinic in Bellevue, WA and volunteering in Kelsey Creek Park in the summers. My life passion has always been animals. I have been married to my husband, Jeff, for 26 years and we have three boys, six dogs, and three rabbits. Jordan, my oldest son, is also my business partner. Jordan has grown up watching me train dogs and shares the same passion for animals. Jordan has always watched my training techniques and put them into place with our family dogs and his friend's dogs. Recently, Jordan and I spent three weeks in an extensive dog training class with the Bark Busters North American Master Trainer to expand and refine our training techniques. Each dog we train is a new opportunity to make a difference in a family's life. We consider it an honor to be part of this transformation! Contact us today! We're excited to help you, your family, and your dog!